Social media is everywhere! Your business needs to utilize these free channels. 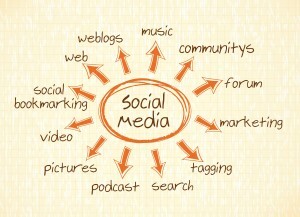 We recommend you know your target audience and pick one or two social media channels to use. Not everyone in your audience is on Instagram (typically a younger audience) Do most of your audience use Twitter? Once you decide, the key is follow through! It takes time and energy to build your audience (or “tribe” as Seth Godin would say…) Consistency is key! Don’t give up on it, if you have relevant content then your audience will come. “Content is king,” is the mantra of social media. If you are posting content that is interesting and helpful, and relevant to your audience, you have a much better chance at building that particular audience. Take advantage of the ability to schedule to posts in advance. This can be a very useful tool when you have lots on your ‘to do’ list (and who doesn’t?) You still need to be aware of what you’re posting and when you’re posting. You don’t want to flood your social media feed at the wrong time. Take this example for instance, Media expert, Gary Vaynerchuk, talks about this on his podcast. He refers to the tragic events of the Boston Marathon bombings. Some folks had their social media posts promoting their new book pre-scheduled and all of those were hitting right after the bombings. Oops! It’s all about being aware! Need help with social media? Give us a call or drop us an email.